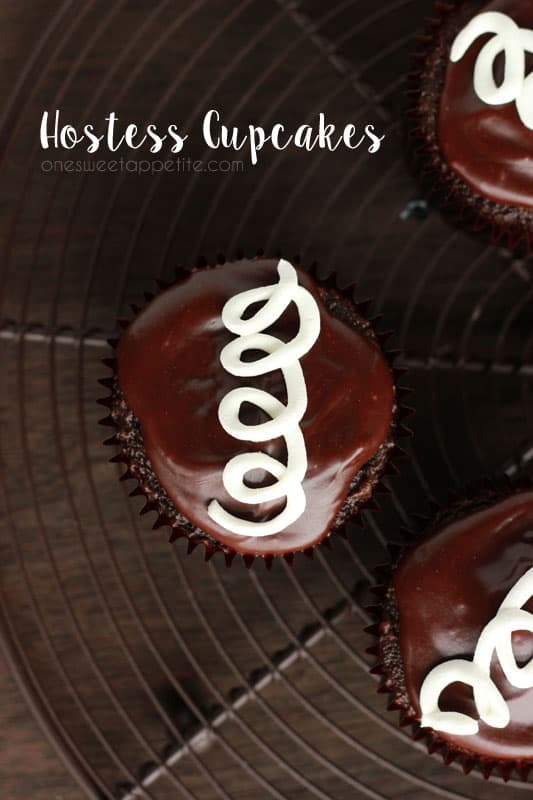 You will have so much fun recreating these classic Copycat Hostess Cupcakes. With a moist chocolate cake topped with a wonderful ganache and sweet cream filling… you just can’t go wrong! It is seriously a toss up which I like more… Hostess cupcakes or Ding Dongs (totally a real thing. Look it up). One has a beautiful swirled top, the other comes wrapped in foil, but both are equally as delicious. Today I’m sharing a quick version of the first. 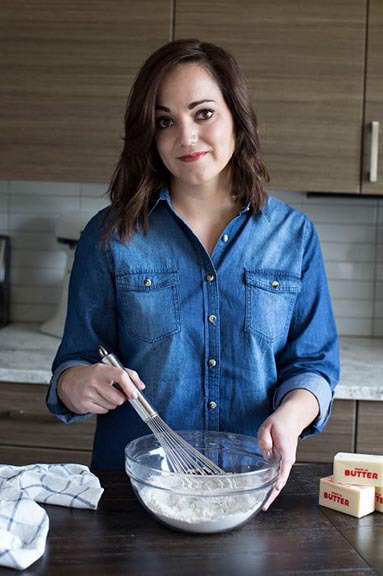 Of course to keep things as simple as possible (and also because I think it gets the flavor the closest), I decided to make this a cake mix hack! I’m no newbie to the cake mix cupcake game… One of YOUR all time favorites that is already on my site has to be my strawberry cupcakes, but I also have a white chocolate AND a caramel apple cupcake. All start with a mix as the base but taste nothing like the typical box version. So don’t bow out just yet. Give these a try and be prepared to never see boxed mix the same again. With back to school just around the corner these are the perfect treat. Take them to meet and greet the teacher, as a classroom treat, or to butter up the office staff. I plan on whipping up a batch with my soon-to-be first grader after his first day as a special celebration. Last year he was only in school for a measly 3 hours… THIS year he will be gone for SEVEN hours. That’s 420 minutes of uninterrupted mom time. I don’t even know what to do with myself. Maybe I’ll throw a mini party and clean the bathroom OR maybe I’ll get crazy and finish all of the laundry. Who knows where the day will lead! Preheat your oven to 350 degrees. Line 2 muffin pans with paper liners. Combine the ingredients in the bowl of an electric mixer. Stir until smooth and fully combined with the paddle attachment. Whisk the butter with the marshmallow until fully combined. Add the vanilla and powder sugar and mix until incorporated. Place in a plastic sandwich bag, seal, and snip the edge. Push down into the cooled cupcake and lightly squeeze until full. For the ganache: Heat the cream just to a boil. Pour over the chocolate chips and allow to sit 3 minutes. Stir until melted. 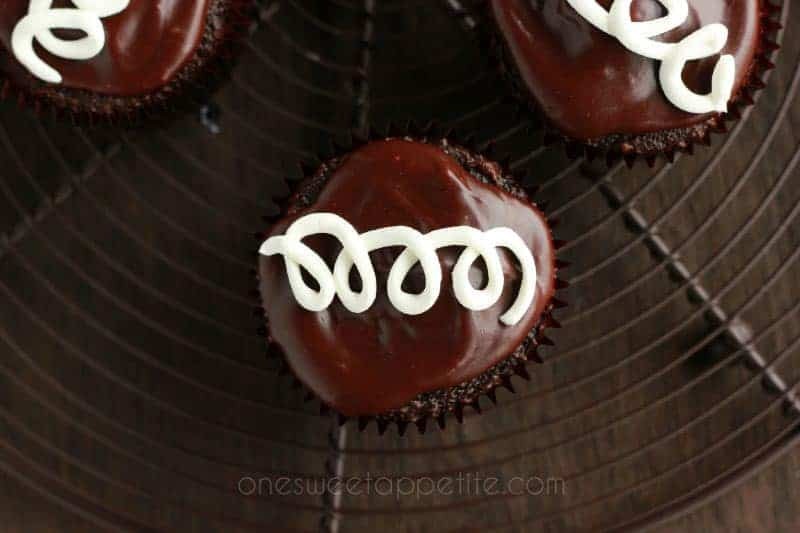 Spoon ganache onto each filled cupcake. Seriously addictive. Maybe a silly question but approximately how much is full? Should I make a small hollow in the cupcake,on top? & then fill with x amount? Not a silly question at all! I don’t remove the center but that’s definitely a good alternative. I usually push the bag filled with the cream straight down into the cupcake. Give it a good squeeze until the filling starts to overflow out of the top. Cutting a small hole (follow this tutorial: https://onesweetappetite.com/2014/01/fill-cupcake/) would be just as easy.